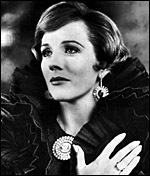 Perhaps if she had been born ten years earlier Julie Andrews (born Julie Wells in Walton-on-Thames) might have had a career in British films, equally, though, she might not have become a world star. As it is, her film relationship to British cinema is marginal: The Americanization of Emily (US, d. Arthur Hiller, 1964) was made here, she played celebrated British stage star Gertrude Lawrence in the US-made, Star! (US, d. Robert Wise, 1968), and starred in The Tamarind Seed (US, d. Blake Edwards, 1974), Victor/Victoria (US, d, Edwards, 1982), and Relative Values (UK/US, d. Eric Styles, 2000), in Gladys Cooper 's old stage part. Theatre success in My Fair Lady took her to America, where she scored major hits with Mary Poppins (US, d. Robert Stevenson, 1964) and The Sound of Music (US, d. Robert Wise, 1965). It seems a shame that she, quintessentially English, has wasted herself on many feeble American films when she could have found feeble films at home - and 'home' needed her more. She was created DBE in 2000.